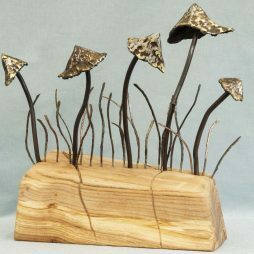 Val’s metalwork is often spontaneous and organic in form. She believes in impressing on steel a delicacy that belies its inherent strength, and her training in textile art has led her to develop a style that bridges both crafts, by subtle and refined interaction through simplicity and texture. Flora is a significant inspiration in her work, arising from being a keen gardener. Val enjoys arranging these elements into sculpture that is simple, flowing and inviting to the touch.